German born, British educated illustrator and author Britta Teckentrup has written and illustrated over 60 books, a handful of which have been published in the US. 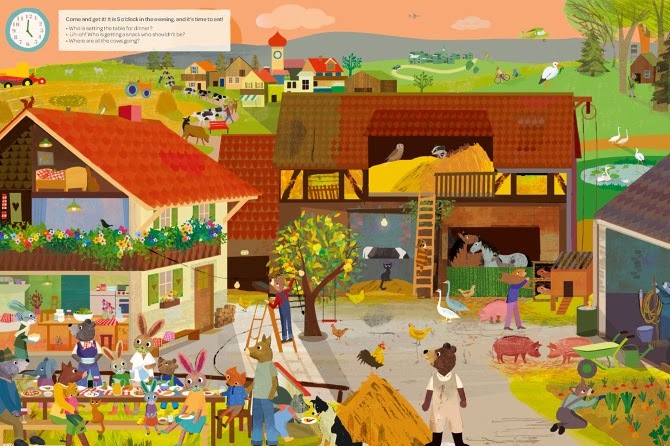 While I recall seeing several of her books over the years while working as a bookseller, I feel like the publication of her two newest books, Busy Bunny Days: In the Town, On the Farm & At the Port and The Odd One Out : A Spotting Book, will bring her the attention that she deserves. And well they should - these are two spectacular, gorgeous, stand-out books! 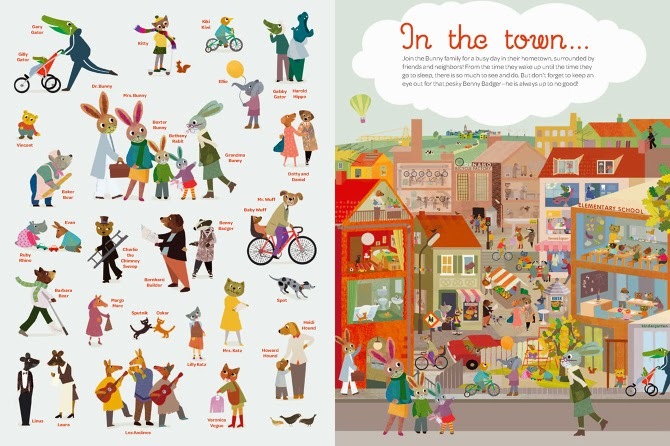 Originally published in Germany as three separate books, together Busy Bunny Days: In the Town, On the Farm & At the Port makes for a visual feast that calls to mind one of my all-time favorites, Richard Scarry. 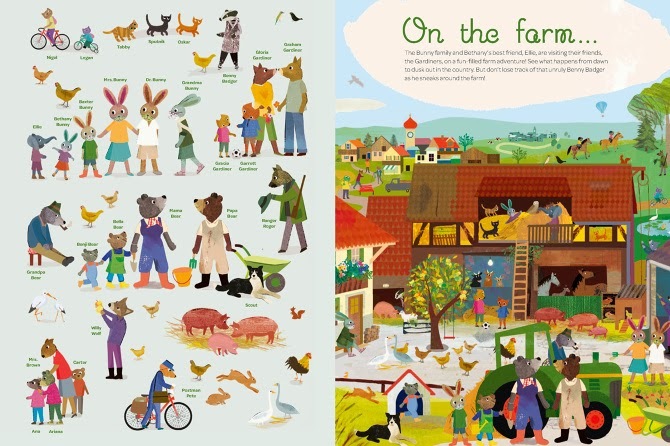 Each of the three sections of Busy Bunny Days: In the Town, On the Farm & At the Port begins with a visual introduction to the characters in the story, the Bunny family, Ellie and Benny Badger being the constants in each of the three sections. 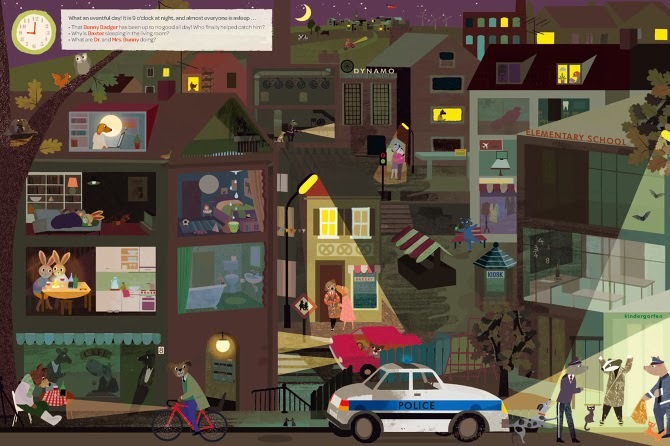 From the time they wake up until the time they go to sleep, readers get to peek in on their day and pick them out from the many people and activities going on. Like a play, the setting stays fixed over the course of each section, with the action of the characters changing as the day progresses, prompting the visual narrative to unfold. 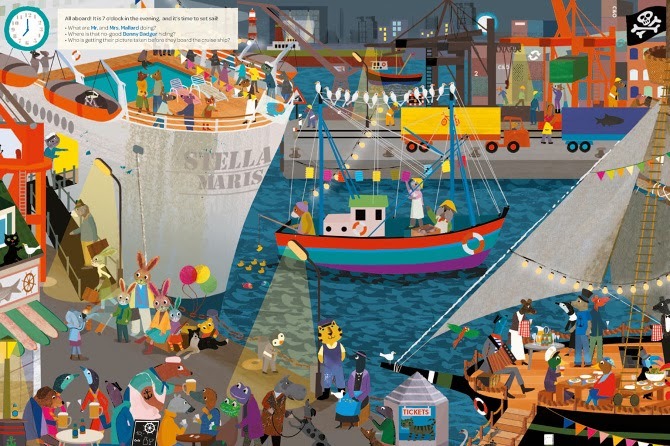 Sometimes a truck is blocking a portion of one scene, moving on the next page to reveal something new to the action. A small clock accompanies the text on each page, which tells the time of day and gives readers three different things to look for, along with Benny Badger, who is always getting into trouble. Teckentrup's illsutrations are charming and her use of animals as characters add to this. 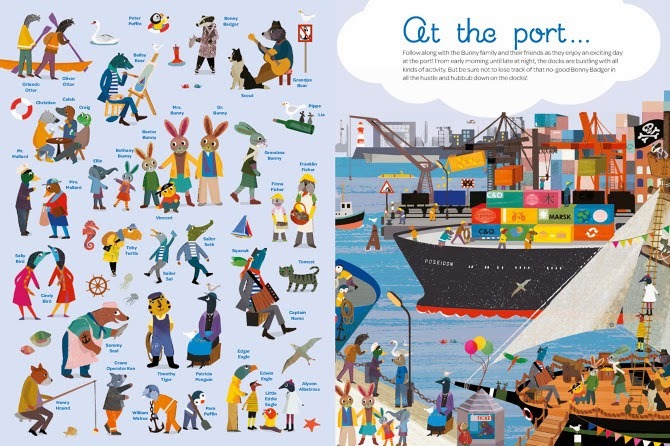 As you pore over Busy Bunny Days: In the Town, On the Farm & At the Port, you'll be amazed by just how much she can fit into any scenario. And the fixed settings will have readers flipping back and forth from page to page looking for small changes. 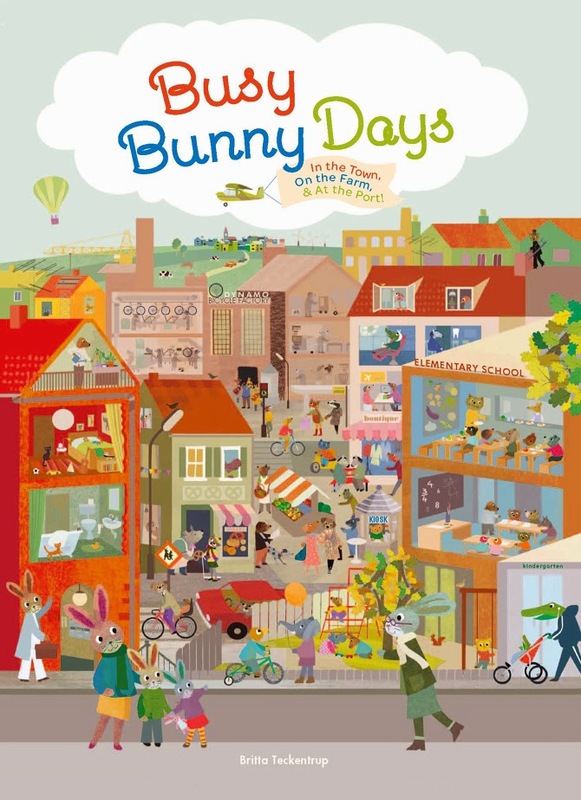 Busy Bunny Days: In the Town, On the Farm & At the Port is definitely a winner that just might be on the shelves for as many decades as Richard Scarry's books have!